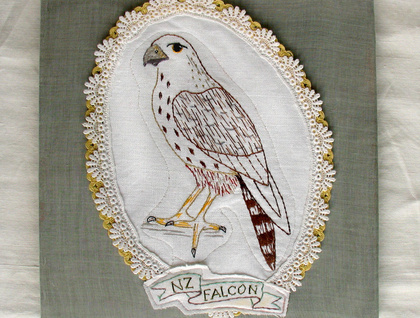 Hand Embroidery of the majestic New Zealand Falcon. 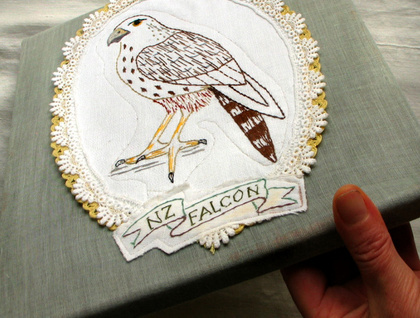 Set in an oval boarder, appliqued to a gentle grey-brown cotton, and stretched over a pine frame, this wonderful bird is truly a work of art! Ready to hang with hooks and wire. please let me know if you have a specific location you would like a postal quote for, if it is not included in my shipping options. Contact birdspoke to enquire about payment or shipping options.